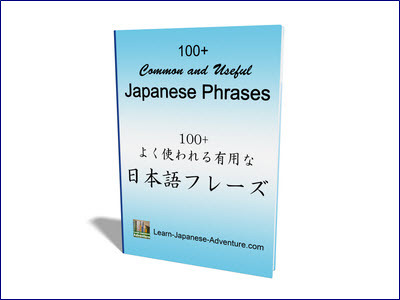 In this lesson, you'll learn using a Japanese expression to make suggestions or to give advice. Generally, this expression ends with ～ほうがいいです (~hou ga ii desu). The english equivalent is "It's better to ~" or "You had better ~". Depending on the situation, this expression may sound like you are imposing your opinion on the listener. Therefore, consider the context of the conversation carefully before using it. If you want to suggest something or give advice in a positive way, use the first sentence pattern "Verb (た-form) ほうがいいです". If you want to suggest or advise in a negative way (i.e. against doing something), use the second sentence pattern "Verb (ない-form) ほうがいいです". Meaning: I have a headache. Meaning: You had better take some medicine. Meaning: I am going to Japan for tour next week. Meaning: It's better to buy (travel) insurance before going. Meaning: I am taking a test tomorrow. Meaning: You had better not watch TV tonight. 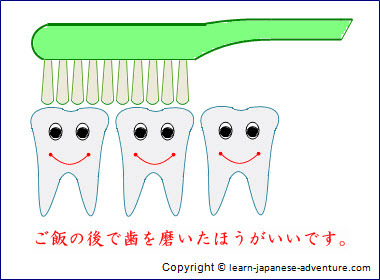 Meaning: It's better to brush your teeth after meal. Meaning: Since it's dark, it's better to switch on the light. Meaning: It's better to take your time and rest when you have a fever. Meaning: It's better to ask teacher when you don't understand. Meaning: It's better not to read book in a dark room. Meaning: Since it's already late at night, it's better not to make a phone call. Meaning: He is already an adult. You had better not worry too much. Meaning: It would be a good idea if you go to Akihabara. Meaning: How about going to Akihabara? The above example illustrates a situation in which a simple suggestion is given. 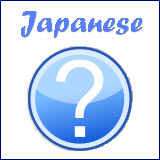 In such cases たら (tara) sentence is used. 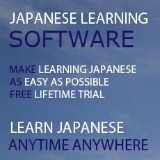 "Verb (た-form) ほうがいいです" implies a comparison and a choice between two things even if it's not expressed in words. Like I've mentioned before, be careful when you're using this Japanese expression when giving suggestions or advice as depending on situation, it may sound like you are imposing your opinion on the listener. Therefore, consider the context of the conversation carefully before using it.